So, it has been two-and-a-half weeks since I cleaned the house for that dinner party. The cleaning service hasn’t been here in over 5 weeks. And while it is lovely to be saving that money, here’s what happens when I know that I will never again have to straighten up the house so that someone else can clean it. It degenerates rapidly, shockingly rapidly, into its natural state of complete chaos and filth. Don’t believe me? I took pictures. In my defense, I have been sick, and so have the kids (including the man-sized-kid). Also, nearly a month ago I started this blog thingie, and it has slightly cut into my prime 11pm-1am house cleaning time. Oh, and that whole exercise addiction is kind of messing with my crap-picking-up mojo. But yeah, there’s no excuse for what you are about to see. We'll start small. 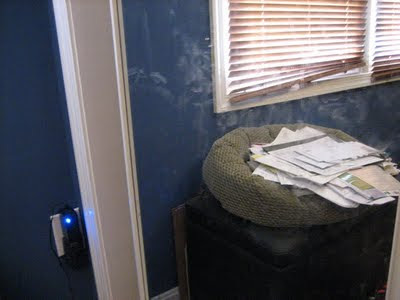 Here is the "to be filed" pile... stacked up on an old cat bed... and reflected in the mirror my kids like to use to make out with their own reflections. Nice. 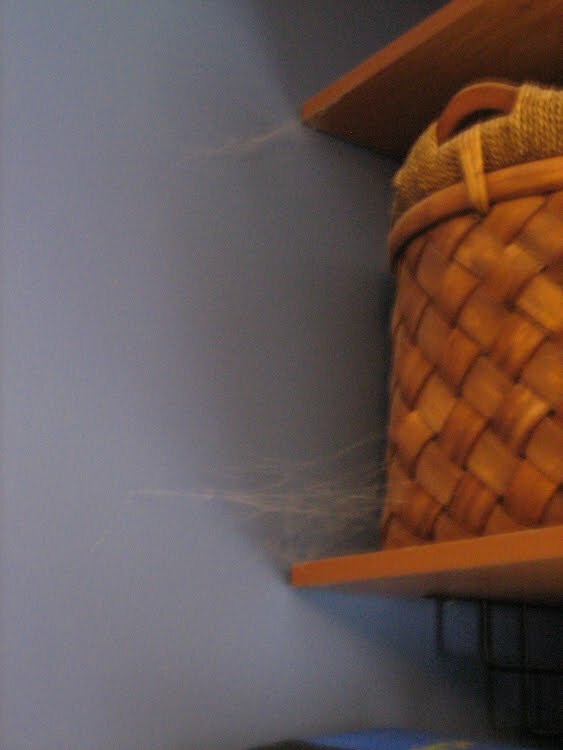 Here is my dresser. It houses a lovely glass-top humidor for my cigars, a beautifully carved box for my Tarot cards, an engagement photo and a photo of some amazing women in my life... ALL TOPPED WITH MASSIVE PILES OF CRAP! This next one is not exactly my fault. Except inasmuch as it's my house, so everything is my fault. We asked the cleaning service not to clean our desks in the office, because they were moving our very important and organized papers and whatnot. (More on that in a moment). They took that to mean not to clean anything at desk level and above. So now we have cobwebs festooning the top half of the room. And, um, speaking of our desks. This one might be the most embarrassing of all, because truthfully, this is not temporary. My desk actually always looks like this. I am generally a neat person, but... yeah... no... this is my work process. Wait, I can't post this picture. OK, I'm posting it. This is where the magic happens, my friends. This is where the words are born. This is what I'm looking at right now. 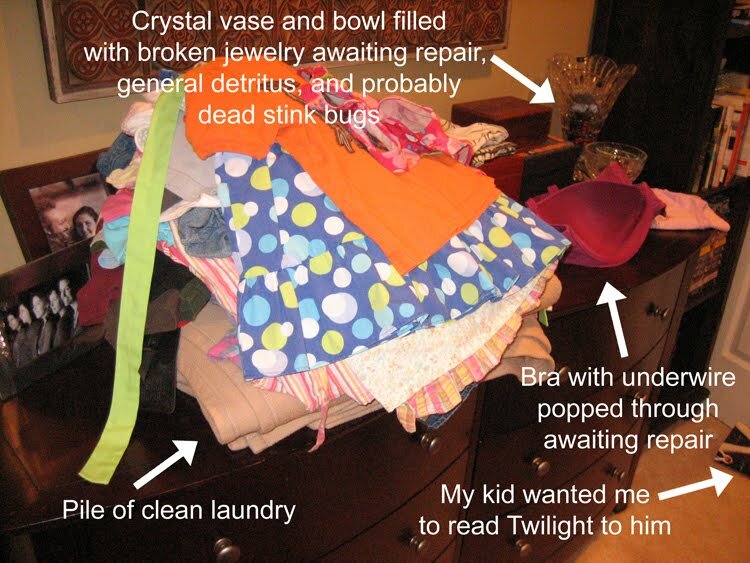 Apparently this clutter problem is genetic. Here is the kiddos' bathtub. 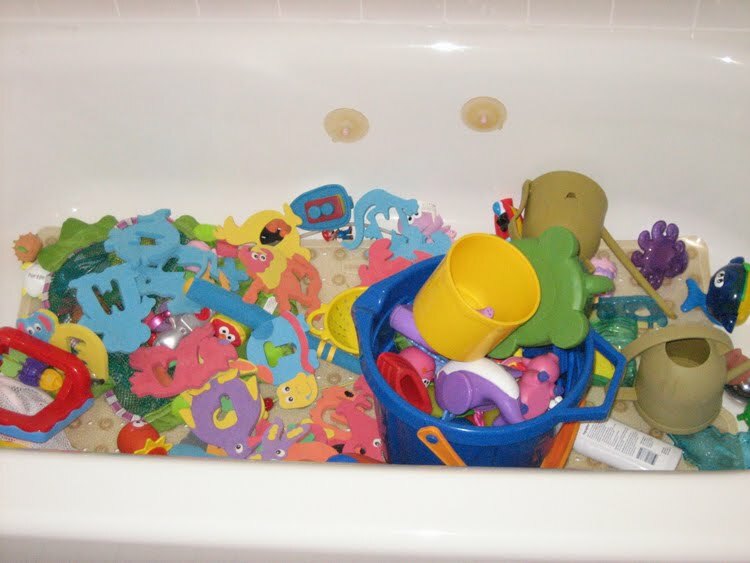 I have a couple of plastic frog thingamahoozits on the wall for storing their bath toys. They prefer them like this. 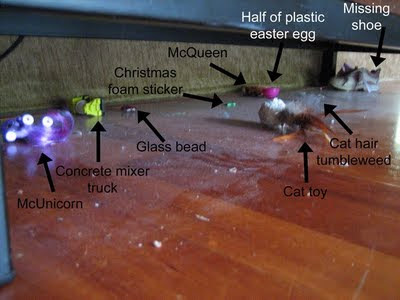 Finally, my friends, I will leave you with a view under my sofa table. This sofa table is the first thing you see upon walking into my house. It is from one of my favorite furniture stores, Room and Board, and is a token example of real furniture (that is to say, the back is made of actual wood, not cardboard - whoa). When the sun comes in through our full-lite double front doors in the late afternoon, it perfectly illuminates... the utterly disgusting dust and filth underneath this sofa table. Et voila. So everyone... all of you wonderful people who have only seen my house in relative neat mode... 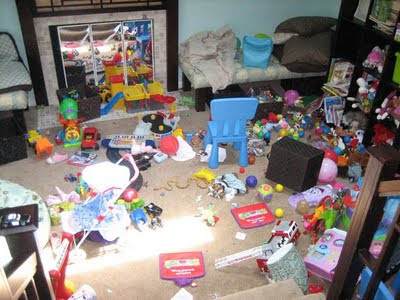 I mean, yeah, sometimes I still apologize for the mess, but I let you come over, so you know I at least wiped the cat hair tumbleweeds out of the corners and made sure you could actually cut a path to the bathroom... next time I tell you I can't host playgroup because my house is a disaster area, now maybe you'll believe me. Everyone else, the few of you who have seen my house looking like this, all I can say is that I must really love you. 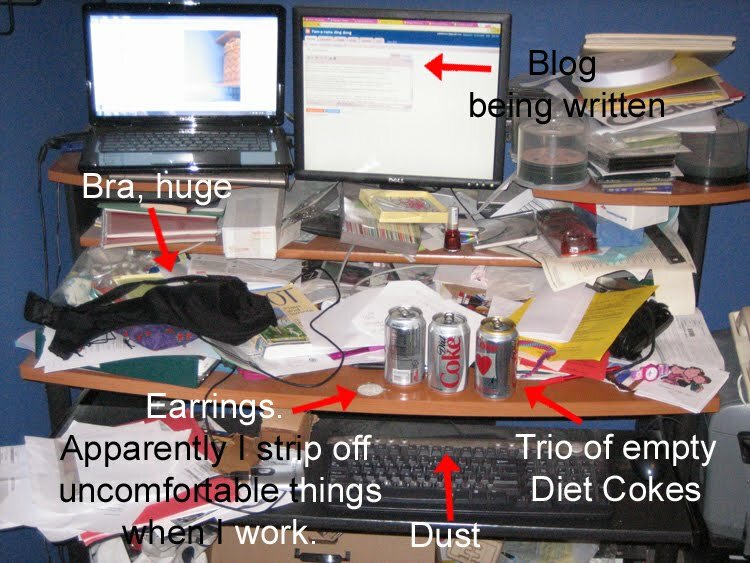 I believe that a messy house is a sign you are living your life...not wasting time keeping it clean. I am a "straightener" that is to say if someone comes to my house they probably won't see a lot of clutter - BUT the dirt Sigh the dirt and grossies under things are there for sure. We have hardwood stairs and as Em is walking up them she picks up "yuckies" (AKA Dust bunnies)and hands them to me... on every stair. Thanks for sharing, I can especially relate to the diet coke trio. I think the captions are the best part of this post. 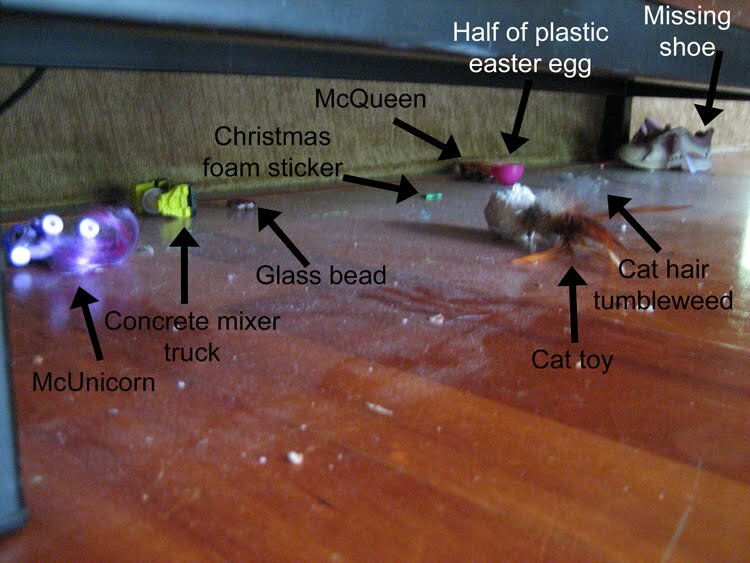 Especially since I could swear that "glass bead" and "Christmas foam sticker" weren't originally there!